The strongest ever recorded Hurricane known as Hurricane Patricia is heading straight for one of the most popular cruise destinations in Mexico. Puerto Vallarta which is located on the west coast of Mexico is right in line to be hit by the most powerful recorded Hurricane ever. Hurricane Patricia which formed in the Pacific Ocean has maximum sustained winds of 200 MPH, the strongest wind force ever recorded by the National Hurricane Center in Miami. At the moment Patricia is located about 125 miles Southwest of Manzanillo, Mexico and moving North at 10 MPH. Hurricane Patricia is at a category 5 which is the highest number that can be given to a Hurricane. We cannot state enough how dangerous this Hurricane is and will cause major disruption across Mexico. There will be very strong ocean swells, strongs winds and extremely heavy rainfall which can cause landslides. Hurricane Patricia is also one of the fastest growing Hurricanes recorded and has become a shock to many. Those people located on the coast will need to take urgent action to stay safe until the storm passes. Puerto Vallarta is a well known cruise port in Mexico and is a popular part of many cruise ship itineraries. So far no cruise lines have reported any itinerary adjustments. There powerful storm could cause major damage to the cruise port which might affect upcoming calls. We will update this post on any new developments affecting the cruise industry. 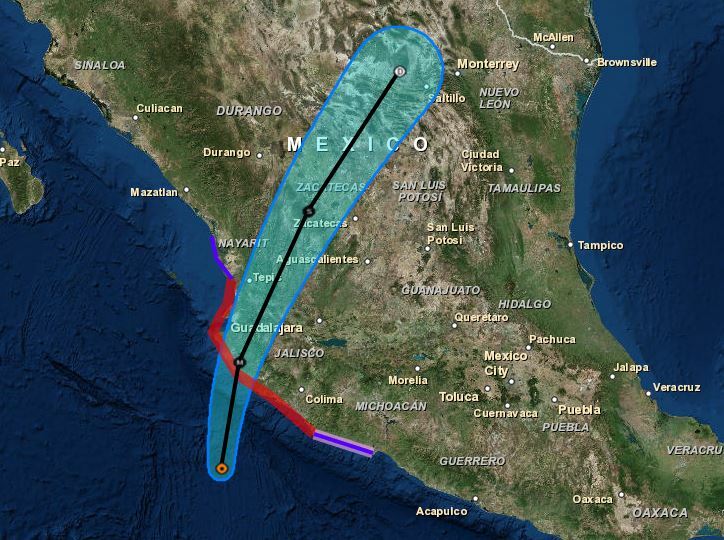 Keep track of the category 5 Hurricane Patricia at our Hurricane Tracker.